The past 4 years have shown that Portland is a formidable force in the craft beer industry. Heck, 4 years? You can also say for the past 32 years since DL Geary’s incorporated that Portland, Maine has made big impacts on the beer industry. I’ve ran into beer geeks who take their annual beercations to Portland just from what they’ve heard online about our local beer. 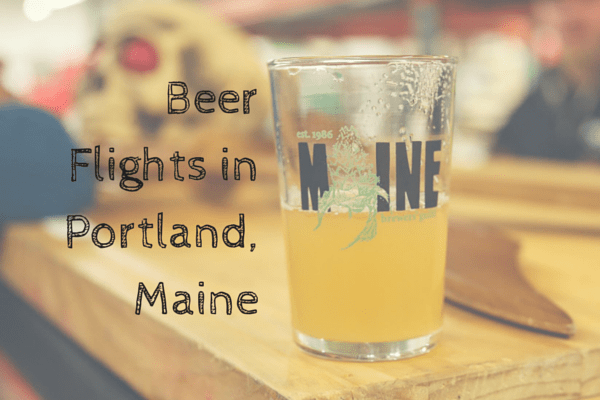 I want to show these people what Maine has to offer for craft beer in their limited time here. The best way to do that? Beer flights. Most bars that serve craft beer will give you small samples or half pours of anything on draft. They want you to try the milk before you buy the cow, except this with beer. This way customers can try beer that they’ve never had or might be skeptical about before they make their full purchasing decision. 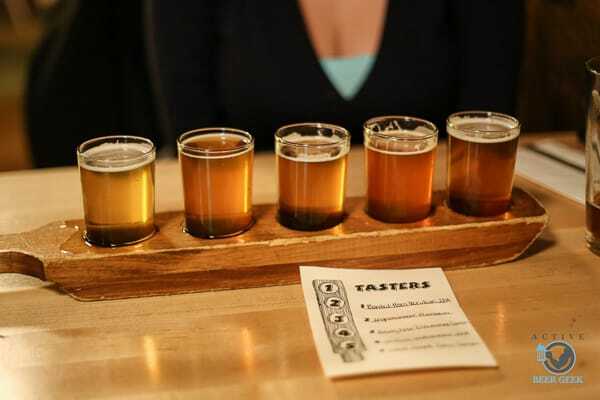 The places below are locations that you can have both a flight of beer as well as a meal. There are other breweries like Rising Tide and Oxbow in Portland that provide flights but are just breweries and don’t include a restaurant aspect. A great place that supports local beer is definitely The Thirsty Pig. They may not have a bountiful amount of beer taps but the vast majority of them are always Maine-based beers. They have their own beer tasting board and are in the midst of creating new ones from local craftsman Ross Brown from Maine wood. Stay tuned for those paddles to hit the pig’s sunny deck. Sebago will offer flights of their Maine-brewed beer at their Portland brewpub location. They always offer their year-round selections like Frye’s Leap IPA, Runabout Red Ale, and Saddleback Ale for you to try. The benefit of drinking at their brewpubs is you can see some small batch beers that are only poured in the pubs. One of my favorite spots on the West end of Portland is Little Tap House. 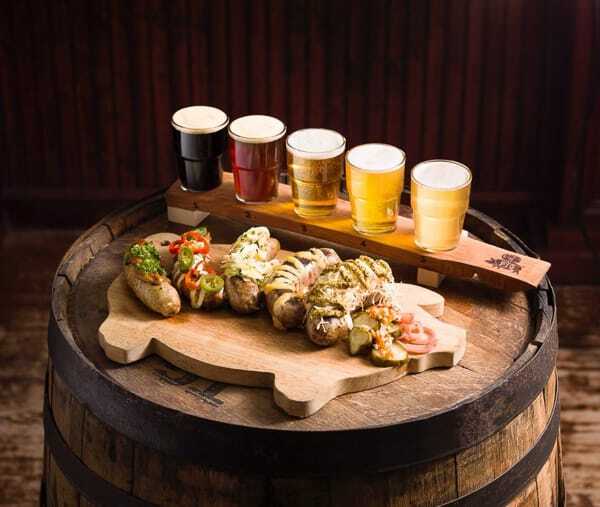 Not only do they provide a great focus on beer and food and how they play together but they also offer beer flights. They offer four 4oz samples of anything on their draft list for a solid $9. 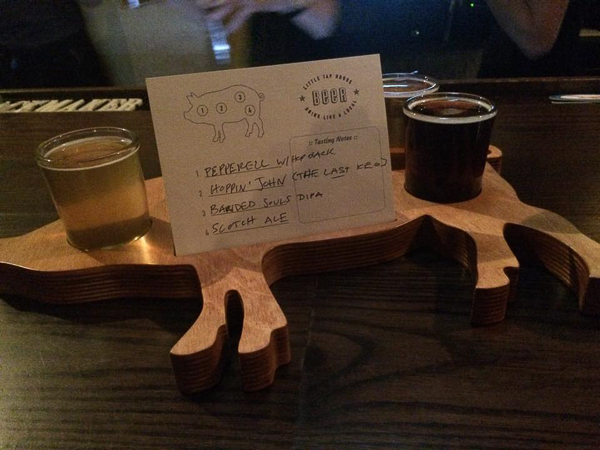 The boards you experience the beer flights on are also hand-made by one of the owners Brianna by hand. Soon you can catch her company called Craft Boards for your own custom-made beer flight paddles. 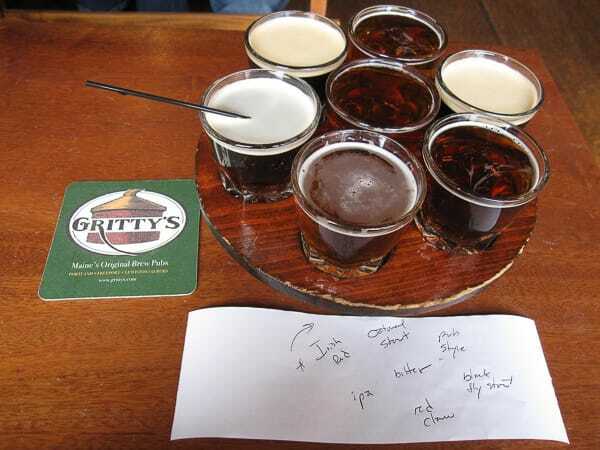 Since 1988, Gritty’s has been a staple in the Maine beer scene. Their English-style beers can be found in brewpubs in Auburn, Freeport, and in the heart of downtown Portland. They offer 4oz flights of their beers at all locations. What a perfect pairing with a burger at lunch time. Great Lost Bear has been around since 1979 and is the perfect place to offer flights of beer due to having over 50 beers on tap. 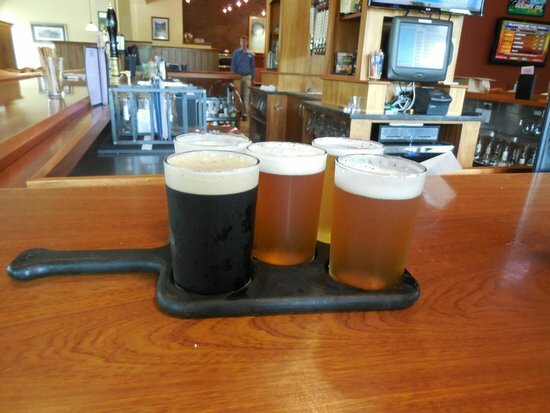 That means you have so many options to mix and match in a beer flight paddle. Pair that with Great Lost Bear’s awesome pub food and you have the perfect lunch or dinner. Liquid Riot is a new kid on the block and they have shown since they opened two years ago that they are here to stay. This past year we’ve seen them start to serve only their beer at the brewpub/distillery on Commercial Street. Before that it was a mix of their own and guest taps. Not they’ve been able to brew enough variety to fill their 13+ tap lines. You can find Belgian-style, IPAs, German-styles, and even lagers on tap. 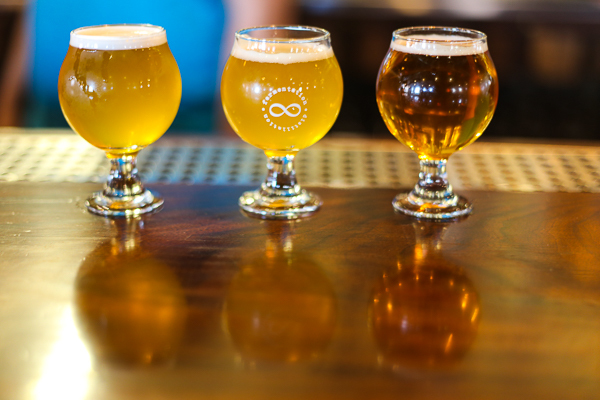 Head on over and try a flight of their beer, it may surprise you.